For those unaware, Bluegrass Airlines is running another rally, this time the Bluegrass Can Am Rally 2017. I have already unofficially flown the NZAR and GAAR 2016 so I thought I would do this one OFFICIALLY and in THEME Yes, that's right, I've left the C-17 in the hanger and have fired up the incredibly gorgeous Grumman G-73 Mallard by LDR (Original model by Martin Shupe) available from sim-outhouse (details at the bottom). The Test Flight is required to set an initial time for you as a pilot and your chosen aircraft so that the organisers can post a recommend Time En-route for each leg. 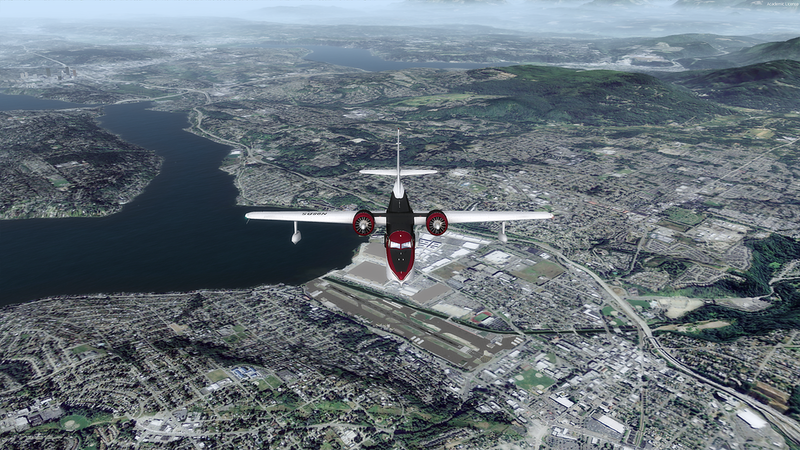 This test flight sees us taking off from either Seattle-Tacoma Intl (KSEA) or Will Rogers Wiley Post Meml (W36), I took the water route considering the Mallard, and once airborne climb to a cruise altitude of around 4000-7000 then pass overhead Renton (RNT) on the 197 track towards Graye GR. The time enroute is to be reported from passing over RNT to GR. And we're off racing past Renton. The first time I flew this flight was the first time I flew the Mallard and I completely stuffed it up and was only getting around 110-120Kn. Majestic Mt Rainer in the distance. This time though I had more of a handle on how to fly the G-73 and had her properly trimmed and leaned. Did you know you can tell you've got the right lean mixture by the sound of the engines??? Genius!! Passing over the docks. 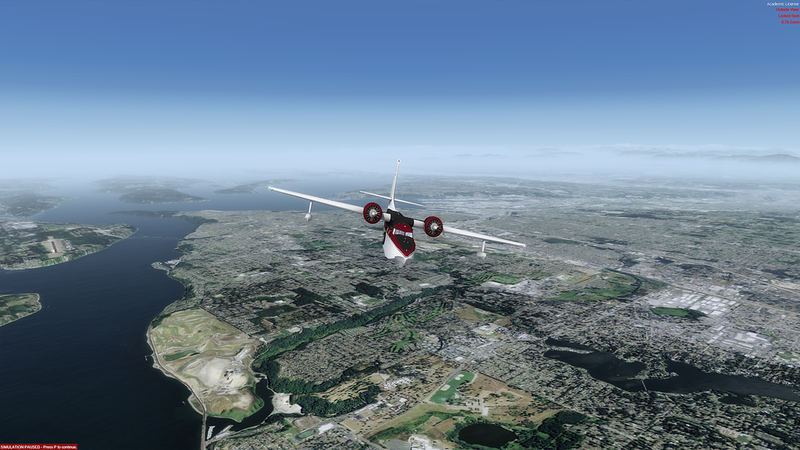 Before I flew the flight, as I normally do, I scoured the freeware resources for scenery and came across BlueSky Scenery. 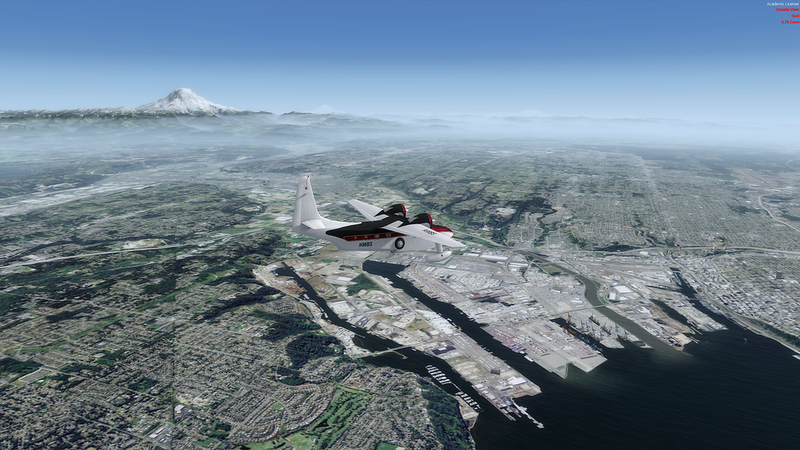 They have done an INCREDIBLE job with Ortho for several west side states and so I grabbed what I needed in the Washington state area for this flight and the results do not disappoint. Normally I would do this myself in X-Plane with Ortho4XP or FSET for P3D, but since this was already done for me I thought I'd take advantage of it. Links at the end to their website and I'll be making a donation later too. Thanks for reading guys and gals. I look forward to bringing you the rest of the Rally soon in an OFFICIAL (as in I participated in the rally, I am not way, nor will my post be affiliated or representing the organisers) post soon. IF this rally turns out like the MEBAR (and I suspect it is quite...hahaha), you will be glad your cruise speed was less than optimal. Erring on the side of Too Slow on that test flight is always a good idea. It will give you some extra muscles available should you encounter headwinds in later legs, or should you have to deviate from course for weather. Thanks for the looks. That Mallard does look nice....Shupe sure doesn't disappoint. Glad you got the kinks out and got your test flight in, great shots by the way, best of luck in the upcoming rally. Yea, Shupe is a master. This one was done my Larry and his team and has the "executive" interior rather than the "airliner" interior so it's more like a massive air/water borne RV. I've got some pics you'll see when I post the first flight.